Skiing injuries are notoriously difficult. It is a potentially dangerous sport, and the smallest accident can cause problems. We spoke to a man who injured himself in a relatively minor skiing accident. As a regular skier he wanted to get back on the slopes as quickly as possible – but he had to go private to manage it. I was injured when I was out skiing in France. We were in the Alps and, I suppose luckily, it was the last day. It was a red slope, and I consider myself to be a fairly competent skier, so it really shouldn’t have been a problem. But I was coming down slightly too fast, and I took a corner ever so slightly too late. I slipped, and my boot didn’t come out of the bindings properly. I turned my ankle pretty badly, and I knew right from the start that it was fairly serious. As I say, it was the last day so I didn’t end up doing anything about it then. I stopped skiing for the day, and sort of hoped it would sort itself out. But then I got back to London and realised something was pretty wrong. So I went to the doctor, and he said he thought I had torn my ACL, or anterior cruciate ligament – which is one of the amateur skier’s worst nightmares. He sent me off for an MRI, which confirmed that was the problem. He said that I needed physio, but the problem was that waiting list for an NHS physio near me was almost three months. By this point the pain was affecting my day-to-day life, so I decided to go private to have it fixed sooner. How Did You Choose a Professional? I hadn’t ever really had a skiing injury before, but I knew that there were some good physios that specialise in these sorts of problems. I’m quite lucky to live in London, because it turns out a lot of them are based here. I go dry slope skiing just outside London quite regularly, so I asked around there to see if anyone had any recommendations. I ended up finding a physio who deals almost exclusively with skiing injuries, and she set me up with a recovery plan. Initially it was about working out exactly what was wrong, and trying to stop the pain. The short-term aim was for me to go about my life properly again, without having this horrible pain in my ankle. In the longer term, though, I was worried about being able to ski again. I normally ski twice a year, and I was already aware that an ACL problem can put you out for months. So I wanted to make sure that I had a plan that would help me get back out skiing the next time around. She gave me an ‘action plan’ that involved a mixture of visits to her, and exercises that I could do on my own. She also set out exactly what I couldn’t do – things like running, certain movements, and so on. Gradually the visits to her were phased out as the injury got better. Well I’m supposed to be going back out next month. I’ve already booked my flights, so I must be feeling pretty confident! In all seriousness, I’m so glad I made the investment in the end. I still get the odd twinge but it’s basically fine. And I know, if I’d waited the three months that it would have taken to see someone on the NHS, I certainly wouldn’t be in as good a position now. 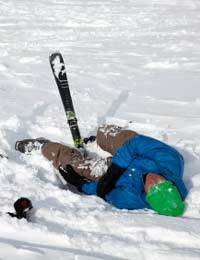 Do You Have Any Tips for Other Recovering Skiers? Don’t leave it alone and presume that it will go away. Things like ligament tears are actually serious injuries, and they won’t just heal themselves. You need to get professional help if you want to make sure that you will be back on the slopes in a reasonable time. Other than that, you have to be prepared to rest. Particularly with niggly injuries that don’t necessarily hurt all the time, you need to remember that your body is still recovering. The less stress you put on it, the quicker you will recover.